I expect it to be a quiet day out in blogger land. The readathon just ended. I, however, just woke up! I knew it wasn’t feasible to read through the night, so I threw in the towel at midnight. Some of you may remember I had 50 pages to go in my third book but wasn’t sure if I could make it. I did! Which hour was most daunting for you? Hour 15 when I wasn’t sure if I could finish the last 50 pages of my book before falling asleep. Could you list a few high-interest books that you think could keep a Reader engaged for next year? YA always does the trick for me! Do you have any suggestions for how to improve the Read-a-thon next year? I always answer no to this question. I like the readathon the way it is! What do you think worked really well in this year’s Read-a-thon? I seemed to have a steady stream of cheerleaders, so that was nice. Which book did you enjoy most? They were all good, but probably I’m Not Her. Which did you enjoy least? They were all great! How likely are you to participate in the Read-a-thon again? What role would you be likely to take next time? I will always be a reader. I try to participate in every readathon, but it just depends on the date! I plan to spend the rest of today working and hanging out with my family. Not sure if there will be any reading involved–I may need a break after yesterday! Fill me in on your stats from the ‘thon! I think I am about to throw in the towel. I have about 50 pages left in my current book but all of a sudden fatigue has enveloped me. I am in bed now and will read as much as I can before the inevitable happens. Overall, I am happy with how far I have gotten, but if I can crank the rest of this book out that will be an added treat. For all of you still going strong, keep it up!! 2. How many books have you read so far? I am midway through my third book. 3. What book are you most looking forward to for the second half of the Read-a-thon? This one may be my last. I will have to see how long it takes me to finish it. 4. Did you have to make any special arrangements to free up your whole day? I actually requested the day off of work! My husband took my stepdaughter over to his parent’s house all afternoon to give me some peace and quiet. 5. Have you had many interruptions? How did you deal with those? I had three breaks that I had to take. Two were to swing by my cousin’s place and feed her cats and the other was to go speak with my old boss to get my seasonal job back. That was successful, so worth it, even though it ate up a good chunk of time. 6. What surprises you most about the Read-a-thon, so far? I usually do some unofficial cheerleading but that hasn’t happened this time around. I have been reading instead! 7. Do you have any suggestions for how to improve the Read-a-thon next year? Nope, it has always been a ton of fun and it seems to run smoothly, at least from my vantage point! 8. What would you do differently, as a Reader or a Cheerleader, if you were to do this again next year? Nothing. I may not have gotten as much reading done as in readathons past, but I think that I have gotten a good amount of reading done and I’m not feeling burnt out. 9. Are you getting tired yet? Nope. I’m on my third cup of coffee though. I will probably stay up another two hours. 10. Do you have any tips for other Readers or Cheerleaders, something you think is working well for you that others may not have discovered? Just don’t over do it. It can take the fun out of it and make reading feel like more of a chore. My break ended up being two hours instead of one, but nothing can be done about that. My reading pace has picked up again. The Days of Abandonment was definitely a novel that required more focus, so it took me longer to read than most books of that size. I am back on YA now with Hooked, by Catherine Greenman. I am going to read that until my husband gets home with dinner (Jersey Mike’s! Yum), at which time I will take a short break for dinner and then I plan to continue reading for the rest of the night. I have about 30 pages left of The Days of Abandonment, by Elena Ferrante. It was time to take a break though, both because I was getting restless and also because I have an errand that I have to run. I doubt it will be more than an hour before I am back to my reading though. I have no idea what my next book will be but I think after the heaviness of my current book, I may need a lighter read. I hope everyone else is having as much fun as I am! I read a little slower this time around because I was trying to read and stuff my face at the same time. I reheated some leftover pizza for lunch and then had some Ben and Jerry’s Peanut Butter Cup ice cream. Now my belly’s full and I am getting back into the swing of things. My husband and stepdaughter just left too so I will have the house all to myself! My alarm failed to go off this morning but my husband graciously woke me at around 8:45. So I am only a tad late to the party. I have my coffee in hand (my first of many I am guessing!) and I am ready to go! 3)How many books do you have in your TBR pile for the next 24 hours? 8 plus my kindle. 4)Do you have any goals for the read-a-thon (i.e. number of books, number of pages, number of hours, or number of comments on blogs)? Nope. Just to have fun! Although I do hope to finish at least 3 books. 5)If you’re a veteran read-a-thoner, any advice for people doing this for the first time? Take breaks. It is easy to get burnt out, so if you start getting restless, do something else for awhile. It’s here, it’s here, the readathon is (almost) here! I am so excited guys. I have been eagerly anticipating the readathon for the past few weeks and everything is falling in to place. I have tomorrow off of work and my husband is off too, so although it is our weekend with my stepdaughter, he will be home to entertain her so I can read. The readathon starts at 9am here and that is usually around the time I wake up, so my plan is to get up as normal, make a big cup of coffee, and settle back down in bed with a good book. I can guarantee I will not be reading for 24 straight hours. It just won’t happen. But I plan to spend all day tomorrow reading and blogging. I now need to head off to the grocery store to stock up on snacks for tomorrow. I will probably be a gluttonous lump by the time Sunday rolls around, but it will all be in good fun. 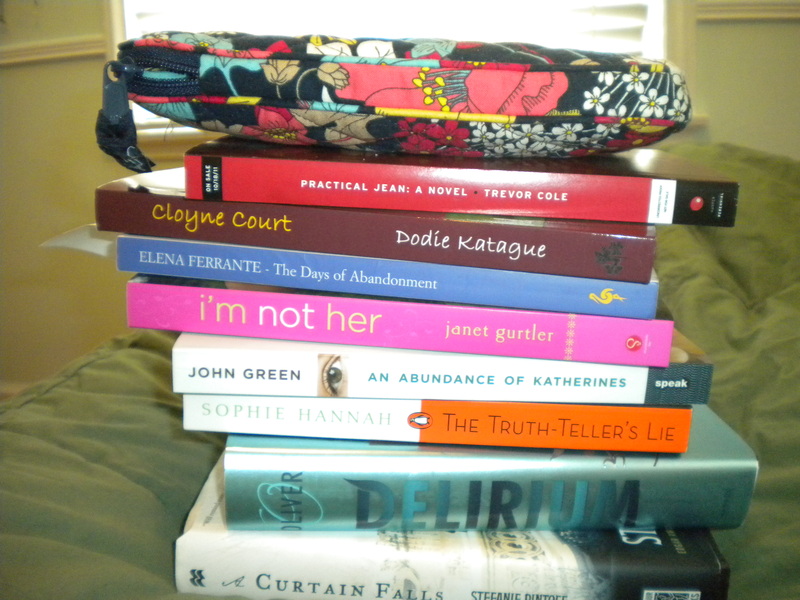 I leave you now with a picture of my readathon stack! First off, I have my kindle. I am not sure what I will be reading off of it, but You Are My Only, by Beth Kephart is definitely on the top of my list of options. The Corn Maiden, by Joyce Carol Oates is also a viable option, because although I don’t normally read short stories, they do come in handy during the readathon! Practical Jean, by Trevor Cole is part of my pile because I have a blog tour coming up for it at the start of next month! Ditto for Cloyne Court, by Dodie Katague! The Days of Abandonment, by Elena Ferrante is pretty short and promises to hold my attention. Plus sometimes I need something a bit heavier during the readathon tol hold my attention. I’m Not Her, by Janet Gurtler is part of my stack because I read her other book last week and though it was awesome. Plus YA is an important part of the readathon diet. An Abundance of Katherines, by John Green is another great YA addition. The Truth Teller’s Lie, by Sophie Hannah was added to the pile because I have yet to read a book of hers that I didn’t enjoy. And a good mystery is always a smart idea for the readathon. Delirium, by Lauren Oliver is there because I have yet to read a bad review for it! A Curtain Falls, by Stefanie Pintoff is the second book in a series and because it’s a mystery and the first book was really good, this addition was a no brainer. So tell me which of these books you have read and whether or not they are good inclusions!